A Non-profit for the Good of Medicine and Patients. A leader of many, follower of unions. There are no dues — we paid them. We are new. Join us. Let's get this conversation started. Goals include employee representation and union association and services. See our About Page. 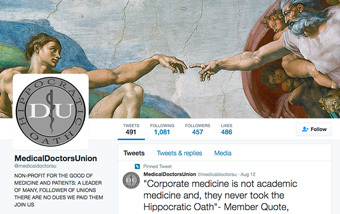 Please contact us at info@medicaldoctorsunion.org to join our member list. * Please include your name, email, title, organization, and phone if interested. Thank you! *Your membership and contact information will not be shared with any other entity without your permission.